So I finally managed to get sat down in time to do a weather watch post which I am very impressed with myself over. Not much to report really though. Never did get that heatwave that the met office promised but none the less it has been quite warm with temperatures around 16 degrees during the day and 9 degrees at night. Still not much sign of any rain but listening to a report from Anglian water on the radio today we don't have to worry about any hosepipe bans as the water table is full and there is plenty of water in the reservoirs...so that is some good news for all of those who grow there own!! Have only been up to the allotment this week to water the tubs and the greenhouse but hoping to get up there over the weekend to do some serious weeding and finally get that beetroot in the ground!! Every home should have one!!!! Well I have been a bad girl again this week with my posting and reading and so again I am creeping and grovelling for forgiveness but I am hoping that life will start to slow down a little now....this week it was due to meetings, doctors appointments, interviews and birthdays......Life certainly is busy!! Then of course on top of all that there is the allotment to see to as well!! Anyway I have been to the allotment a few times over the week although I have to admit it was mainly just to water the greenhouse and planters although last night I did spend a couple of hours there digging over and putting in some tomato plants. I have never had tomato plants on the plot before but we don't seem to have a problem with blight as Kate always has a good crop and I wanted to have a go at making more of my own sauces this year so I have planted out sixteen plants purely for this reason. 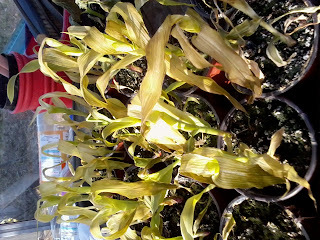 I still have the four plants at home for us to pick and eat and then I have some fancier versions in the greenhouse which were given to me and I will tell you more about them in another post. 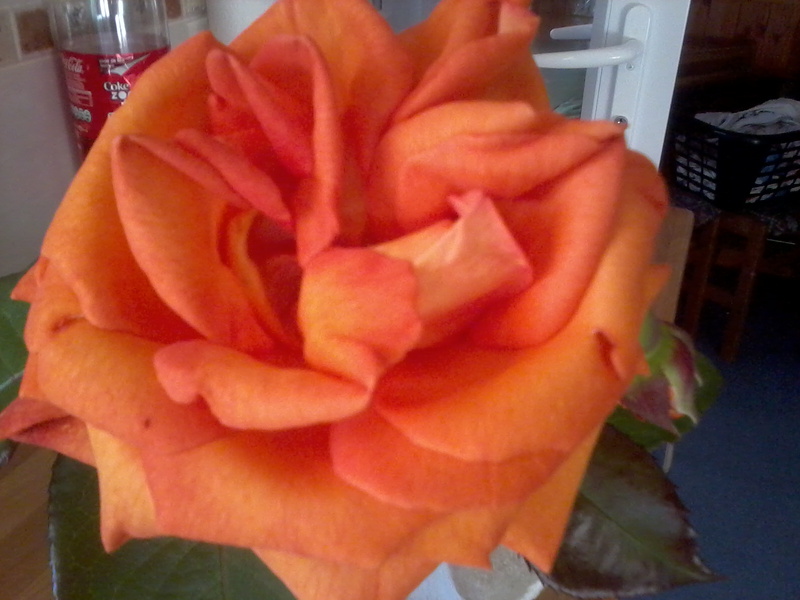 The first rose from Kate's garden which she cut and gave me on my birthday...Thank you Kate...it looks lovely now it's opened fully!! Of course I missed the weather watch again this week but nothing much has changed there anyway...still not much rain....short sharp showers and that's about it...temperatures anywhere between 9 and 20 degrees day and night and the last few days have seen some nasty gusts up to 60m.p.h. So there you have it...that about sums up my week...maybe this week will be more relaxing....Oh I did manage to get some gardening done too...the bedding plants are mostly in and it's lovely to see some green in the borders again....Oh and I almost forgot...what should every home have?????? 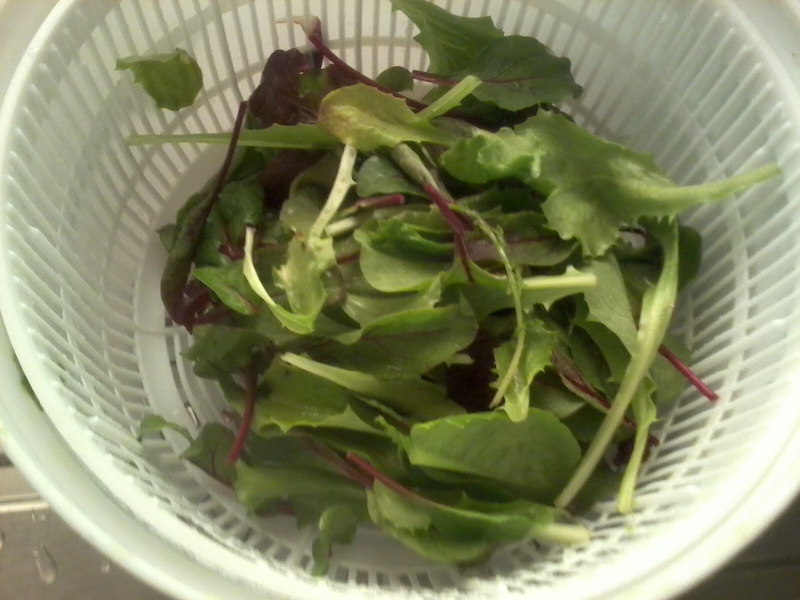 No...I don't mean the salad...although I think there should be salad in every house...I mean the salad spinner....It is one of my favourite buys...it is so nice to be able to wash my fresh cut leaves and then after a quick spin be able to put them in my sandwiches without getting my bread soggy...definitely a genius idea!!! Sorry this isn't the best post of the year...but it is getting late and I want to be up bright eyed tomorrow to catch up with all of my favourite blogs!! Sleep well all.....and happy gardening! Well I did as I promised and I finally got some of the main crop potatoes in today. The King Edwards are finally in the ground although only one row after the mice had their fill of them. That only leaves the Desiree to go so that makes me feel a little better. It certainly was a glorious morning down the allotment although not much life as I got there for 7:30am....I have to admit to loving being down there at such an early hour when all the birds are looking for their breakfasts!! I got a little weeding done too and then was home by 9:00am to start making Sunday dinner....god I love the weekends!! Popped back to the allotment after tea to water the tubs and harvest a few of the salad leaves that were ready for the lunches this week...and that was when I noticed that we had some strawberries ready to be eaten...not many...but enough for me and Kate to get a taster of the delicious fruit....and there are so many more to ripen off. 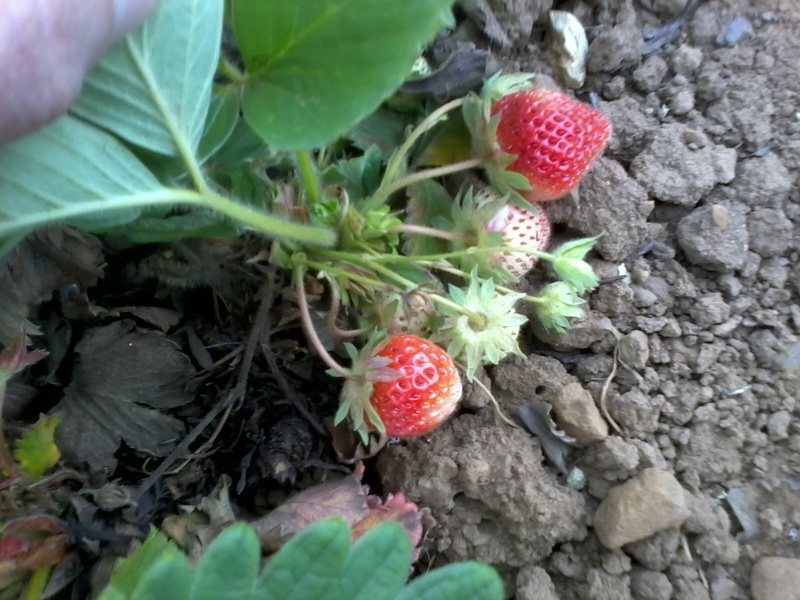 Oh how I love fresh strawberries!!! So much to do...so little time!!!! Well I'm afraid the allotment and the blog have taken somewhat of a backseat this last week and I feel really bad about that!! I haven't had much spare time at all with all of life's going's on and have just spent the last couple of hours catching up with all my favourite blogs....I didn't even find 5 minutes to do my weather watch post and I hope that you can all forgive me! So first lets start with the weather of the last week just so you know what it has been like....We've had a little rain but not much to talk about though a few of the showers have been enough to dampen the ground and give the plants a nice drink. Clouds have been around most days with the promise of a good downpour which basically has been lulling us into a false sense of security. The temperatures have been a little up and down with some biting winds thrown in so I guess they have been between 10 and 25 degrees....most of the time all in the same day!! I have managed to spend some time down the plot but not too much really...I have been wanting to get my maincrop potatoes in but as yet they are still in my shed....They will be in before the month is out though!! 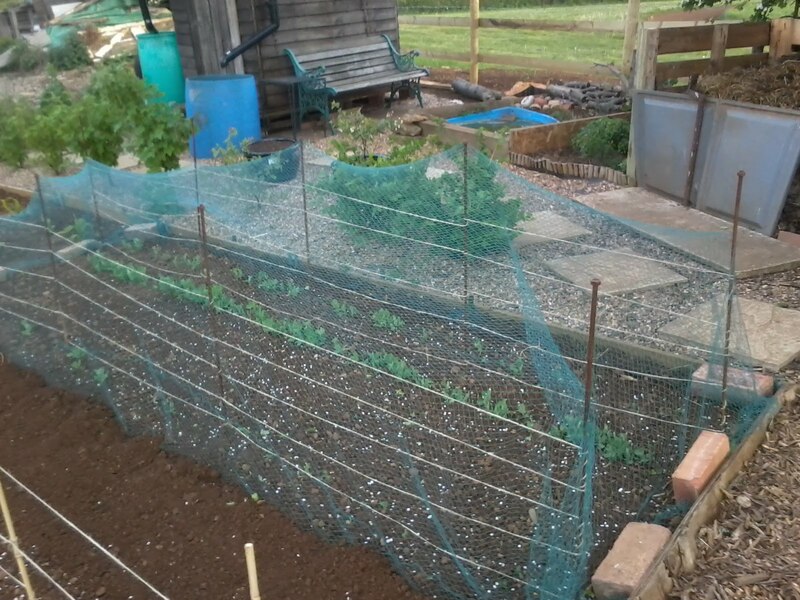 I did mange to get my peas netted to save them from the wretched pigeons....luckily they haven't got too many of them and I'm hoping for a decent crop!! I also got the green pak choi pricked out...this is the first year I have grown this variety and they have done really well...the purple and white aren't very good again so I think after this year I will stick with the green...because they have done so well and the others are looking very poorly I planted plenty of these up in case the others don't come to anything! 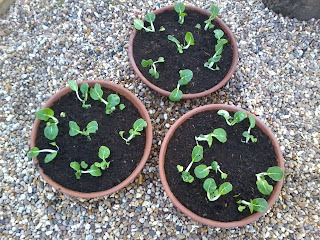 Three extra pots of green pak choi. Although I got my peas netted in time I didn't have netting for my brassicas which have also been slaughtered by the birds so i have sown some more of these in the green house along with some new squash seeds to replace those I lost in the frost. 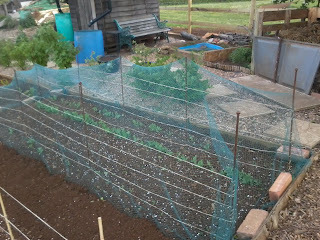 I have since purchased some more netting and have it ready at hand for when the brassicas are big enough to go on the plot....the reason I had no netting was because I hadn't got around to replacing it after I lost everything in the fire last year! 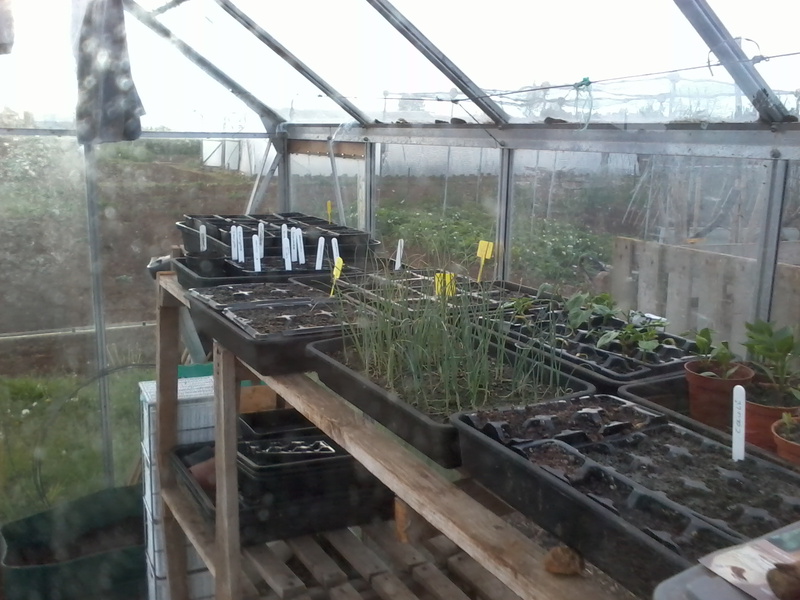 The Greenhouse with some more seeds ready to grow!! So Life has been pretty hectic this weeks with work and meetings and hospital visits and stuff but I am hoping it's going to calm down a little now and that I will get to spend a little more time down the allotment soon...maybe even tomorrow.....but I am finding lately the more I try to plan the less likely it is to happen so I think I will just take each day as it comes and see what I can fit in...at least this way I won't be disappointed in myself!! My turnips and swede have germinated in a lovely line and my first early and second early potatoes are coming on nicely. The black eyed peas are starting to poke though the ground thought the seedling is more like that of a bean. I have three fancy tomato plants in the greenhouse which were given to my by another plotter and they are already flowering as are the melons. The aubergines are also in the ground in the greenhouse but are still quite small. All the pepper plants remain too small to take out of their pots yet. The Swiss chard and spinach beet planted just a couple of weeks ago are through. I'm, quite pleased with how it's all coming on so far...I am waiting for more runner beans as these died in the frost...totally my fault as I didn't put them back in the greenhouse overnight ...oh well...third time lucky!! I also need to get the beetroot in the ground. This was started off in peat pots as I did last year but this year I have grown three different varieties....the boltardy has done great as always but the other two varieties aren't looking very good, (I will check the names out tomorrow) so I don't think I will be growing these again...I think I am going to stick with what grows best on my garden for bountiful crops...though I will keep trying out new things each year as you never know when something will impress!! I managed to get hold of some celeriac seed which again was donated by a plot neighbour but as yet none have germinated and I am now thinking it might be too late to get a crop but I will persevere for a while longer! So I think that's me about up-to-date! I hope you all forgive me my absence and I am hoping a good session at the allotment tomorrow will bring another post...maybe just lots of pictures!! Hope your gardens are all growing well!! Well the weather has definitely had a cooler feel to it this last week with winds coming off the east coast adding even more chill to it. We still haven't had any rain and last night saw a light frosty which hasn't done some of my seedlings much good so I will no doubt be re-sowing at the weekend...a late crop is better than no crop!! 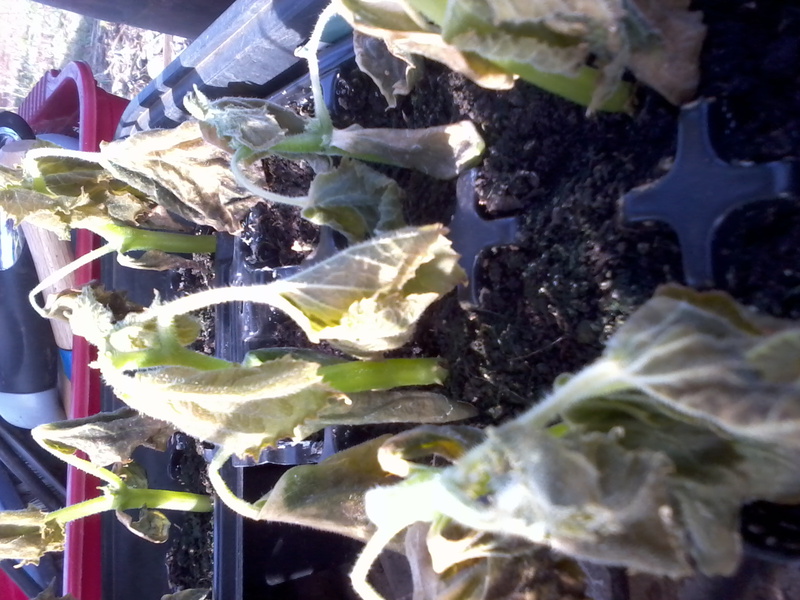 The gherkins still in pots look a little sorry for themselves..as do the squash plants in the ground!! The sweetcorn in the ground is still looking good and it's mainly the squash plant that have been affected but only there leaves and there stems still look nice and firm so fingers crossed for full recoveries. 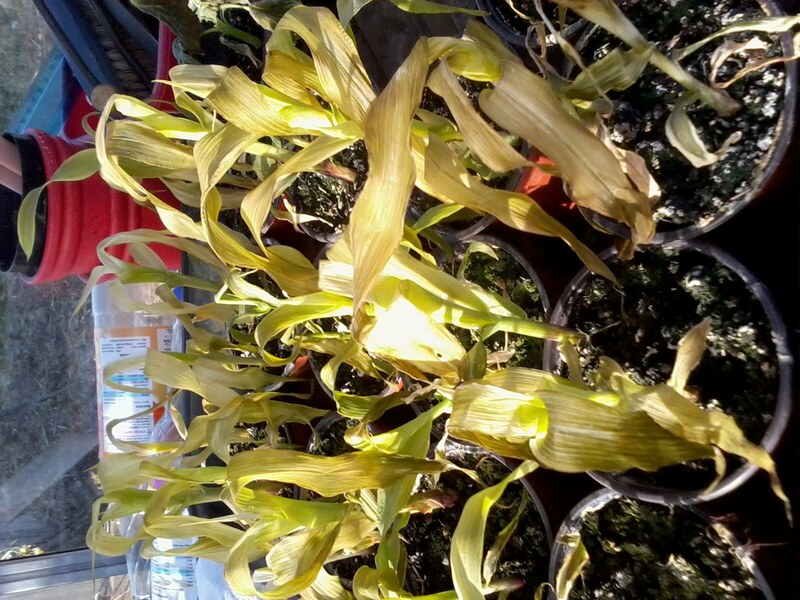 The sweetcorn in pots is looking a little unhealthy after the chill last night but I have moved it back to the greenhouse so hopefully it will recover. I checked back on last year and this frost has come slightly earlier by a couple of weeks...but then again so did the warmth this year so not so different really....does this mean we really are in for some rain?? 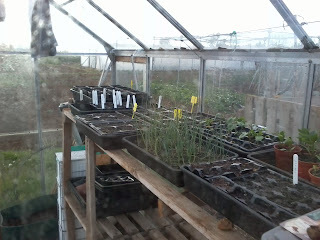 Been quite busy down the allotment and I will post a full crop update by the end of the week. Did anyone else lose anything due to recent weather?? Or am I the only one who suffered with a frost?? Whether you own an allotment , grow veggies in your yard or even just in a small back yard it's important to know that you should rotate your crops. I was told by a friendly plotter right from me first getting my allotment that I should rotate my crops and that this would keep down soil borne pests and such that can sometimes attack your crops. There are only TWO exceptions that I know of to the plot rotation scheme. 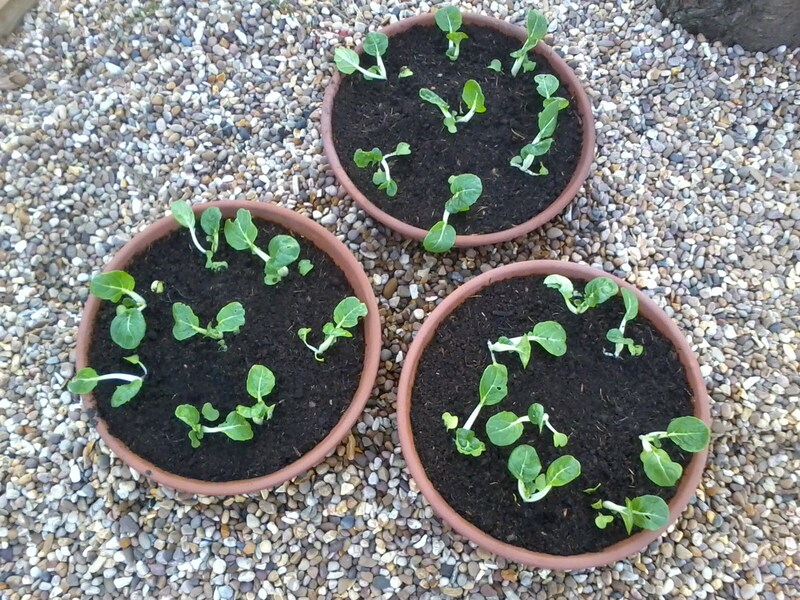 The first is that Runner Beans can be planted year after year in exactly the same spot. The second is if you're growing in bags or containers and will therefore be replacing the matter inside which the vegetables will be growing in. If you know of any more exceptions to crop rotation then I would love to hear them, also for the novices out there....bushes, trees and shrubs do not have to be moved to a new location, we are talking annual veg for rotation. When I was told about crop rotation I was told to do it three yearly which was fine until I got my other half of a plot, I didn't want to split both halves into three and split the contents over the two halves so I was a little stuck on what to do. That was until I read that there is actually a four course rotation, and that this is the best to follow. Crop rotation isn't just about not planting the same thing twice but about how when rotated in a certain order the next crop will benefit form the previous. So starts my four course rotation scheme. Obviously this is my first year and it can't be followed totally to the letter because of last years planting so I am going to class this as year one and work on from there. I have split each of my plots in half which gives me my four sections. (1) section for potatoes, (2) for root vegetables (including onions), (3) for legumes (peas and beans etc) and (4) for brassicas. Next year they will all get moved over one half to keep the rotation working. Squash plants and sweetcorn can be slotted in anywhere but again shouldn't be grown in the same place year after year so I have chosen to put mine in with the root veggies and legumes...this may change as I see how the space grows but I am quite excited about this new system and the ease of planting up the different types of vegetables without being too restricted. So this is how I will be working my plot form now on. It's a simple easy to follow plan which I am loving implementing as it means I can put in the right section what is ready as soon as it's ready and not worry about having to fit something in between at a later date. So how do you all rotate your crops?? There isn't really an exact science to it and I adopted this theory as it was convenient for me so I would love to know what the rest of you do...especially as I am still quite new to this! !